Over the next few weeks we would like to showcase the beautiful donations given by our very generous sponsors as well as introducing the sponsors themselves, some of the performers and some of the hard working feed-a-smile staff members. Today we will start with Miria Moonbeam from Moonbeam Fashion. 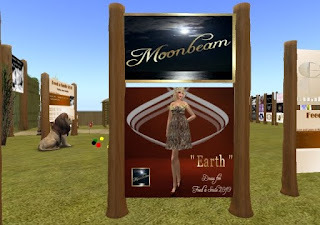 Miria is a lovely lady from Italy and she is the owner and designer of Moonbeam Fashion. In addition to her work as a designer she is a fashion model as well. We had the opportunity to see her once at a fashion show and were very impressed. 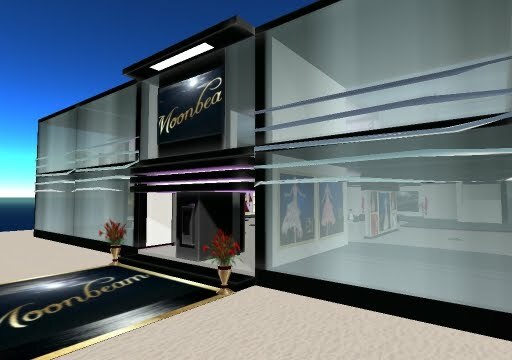 The Moonbeam Fashion mainstore is a very comfortable and warm looking shop from the moment you land there and her designs are very neatly arranged. If you are looking for a new gown then you should stop by where there are some gorgeous ones to be had. Miria's donation, specifically made for the Feed-a-Smile charity event, is called "Earth". 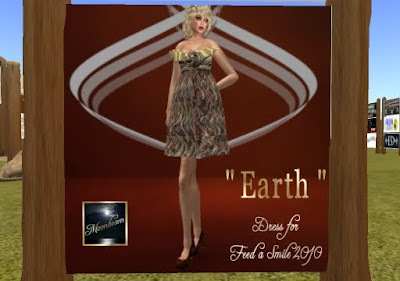 It is a beautiful dress in soft warm colors very much suited to the African theme of the Feed-a-Smile event. See it on the photo below but even better, go to the Feed-a-Smile venue and get this beauty already. Her donation Vendor is already up and running so you are able to be one of the first to have this beautiful dress and help to feed the LLK children in the same time. Thank you Miria for your gorgeous donation and we hope it will generate a lot of meals for the LLK children. I'm on my way to buy this dress!